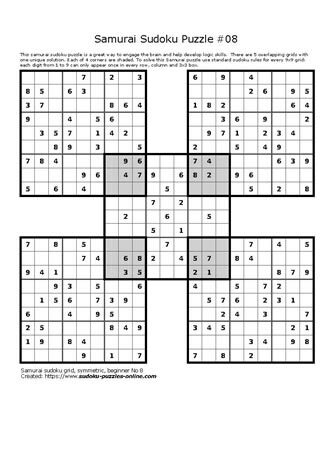 This Samurai Sudoku puzzle requires logic and the basic rules of Sudoku to solve the challenge of an interconnected group of five 9x9 grids. The shaded area is where each of 4 puzzle grids connect with the center grid. And this is also where the puzzle can be very challenging, since it requires the puzzle solver to consider two puzzles, rather than a single puzzle. Use these extreme forms of puzzles to support brain health as it can help to strengthen short term memory and logic skills.